One day I found myself with a craving for chicken salad and barely a spoonful of mayo left in the jar. Ugh. Instead of running to the store, I eyed a tub of Greek yogurt and wondered if it would work… and those apples I had a surplus of, would those work? And should I throw in onions in to the chicken mix instead of stacking them on top as usual? And how about replacing lettuce with baby kale? Well, it did work, and was a perfect way to make a different version of a classic. 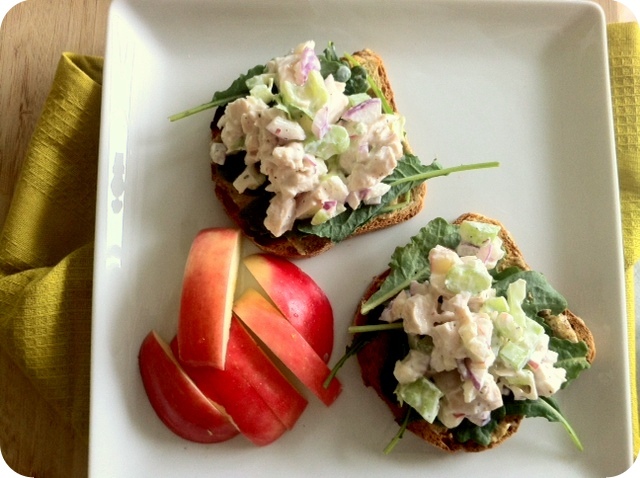 The apples added some sweetness to counteract the tangy yogurt, plus they add to the crunch along with the celery. Putting on top of baby kale on Udi’s Gluten Free bread, and ate it open face (mainly so I could pile on more chicken salad) with a side of apple slices. Yum!!!! Looking at Susan’s recipe, the next time I make this, I will be adding a pinch of red pepper flakes for a touch of heat! Could also be served on a bed of lettuce, in a tomato, or eaten right from the mixing bowl!